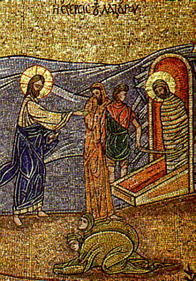 Lazaros, the brother of Martha and Mary, was raised from the dead by Jesus Christ (John 11:1-44). After Christ's Resurrection, Lazaros was placed in a leaky boat with his sisters, by the Jews at Jaffa, and they all landed safely at Cyprus. Lazaros became Bishop in Cyprus and died peacefully thirty years later. His relics were translated to Constantinople in 890 AD.